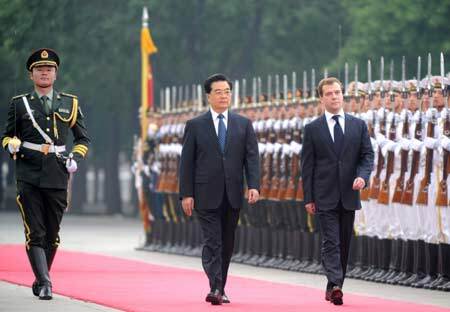 Xinhua photo shows Chinese President Hu Jintao and Dmitry Medvedev in Beijing in 2008. Medvedev finally fired Yuri Luzhkov - this was not a resignation. The Moscow mayor explicitely refused to resign, and Medvedev relieved him of the position citing "loss of trust" which should mean the end of an official career. Interestingly, Medvedev fired Luzhkov while on his first state visit to China (which is a curious event in itself - it started from the former imperial outpost in Dalian and the former Russian trading town Harbin). The irony of the moment seemed to be in that from now on, all important decisions for Russia may be made in Beijing. The more important part of the China visit was a series of energy agreements (a major oil pipeline was officially launched, a bunch of other oil & gas and nuclear energy agreements signed) - the Chinese are willing to invest heavily in the energy infrastructure, which probably means a continued stream of petro-yuans to the Kremlin corporations for the foreseeable future... Medvedev's next stop is the Shanghai World Expo where he's supposed to open the Russia pavilion. After the jump I have posted a video report on the firing. I just saw your blog post about the fact that Medvedev fired Luzhkov in Beijing--that’s really interesting and I wonder why more news organizations haven’t touched upon that fact. There does indeed seem to be a great deal of irony in that action. It also makes a pretty big statement on Medvedev’s part and says something about the assertion of his power. It raises the question of whether this was a good move on the part of Medvedev in asserting his power, or if this will upset the balance of elites in Russia and ultimately undermine his power. I thought that it would be very relevant for many of your readers and hope you might consider embedding this video in your blog. I’d be interested to see what you think about that question. I would want to give Medvedev the benefit of doubt and would want to believe that the sacking of Luzhkov is to be viewed in the context of the positive, forward-looking messages that Med is trying to generate... Of course he doesn't seem to be the best chance for Russia - but there isn't any other. Of course, he is more likely a part of an elaborate hoax, but I'd love to imagine otherwise. Re: "balance of power", there's definitely more to it than we can see. There is a period of uncertainty currently, officials at various levels are sizing up the situation and will be forming new groups and alliances - that was underway in any case, the Luzhkov case was only a catalyst. There will be a new balance. I may be wrong, but Luzhkov is not likely to pursue an independent political career. The liberal opposition views him as a particularly corrupt figure, and the official ER party seems to be split of the Luzhkov's issue. So there would be a significant transactional cost to re-enter the political arena. Plus the advanced age. More importantly, he and his spouse must be more concerned with salvaging their business assets. Firing Luzhkov could be regarded as the first independent step taken by Medvedev, but the future tests (for Med or any other leader), will be much more challenging. There's the North Caucasus issue (esp. Dagestan, Chechnya, Ingushetia) - no easy solutions there, and many more challenges. Reigning in Ramzan Kadyrov would be regarded as a major political win, but at this stage it's something almost inconceivable. Although, "where there's will, there's a way". A softer issue to resolve would be releasing M. Khodorkovsky - I wouldn't be surprised if some consultations were going on, mainly to ensure there won't be a personal vendetta from MK. I would appreciate if a staff member here at jotman.blogspot.com could post it. Kate's video has been appended to the post (see above).